PRO SE PRODUCTIONS’S FIRST AC COMICS NOVEL- ‘NIGHTVEIL: THE QUIET GIRLS BY BARRY REESE DEBUTS! She was one of America’s greatest heroes in its darkest days… She is now the world’s most powerful and alluring sorceress…. And She is working her magic in prose in the debut of her first digest novel-NIGHTVEIL: THE QUIET GIRLS! By arrangement with AC Comics and Nightveil Media, Pro Se Productions brings Nightveil- and the AC Comics Universe- to life in prose! One of the longest lasting independent comic innovators, AC Comics breathed new life into super hero tales by reaching into the Past to blast into the Future! Now Pro Se Productions ushers in a new chapter with its AC COMICS Imprint, debuting with NIGHTVEIL! A mystery spanning decades rears its head in the modern day, plunging Nightveil on a globetrotting adventure that poses a threat not only to her immortal soul but to all life on planet Earth! Will her magic be enough to save the world again? Find out in NIGHTVEIL: THE QUIET GIRLS by award winning author Barry Reese! From Pro Se Productions. 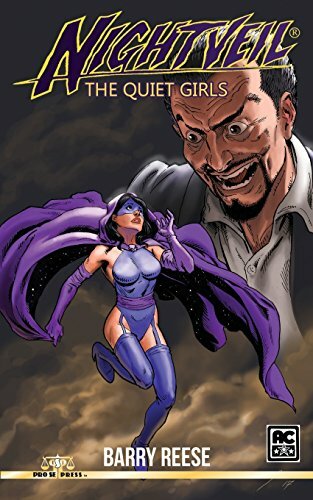 Featuring a stunning cover by John Nadeau, a Blue Bulleteer interior image by Bill Black, logo design by AC Comics, and print formatting by Antonino lo Iacono and Marzia Marina, NIGHTVEIL: THE QUIET GIRLS is available now at Amazon at https://www.amazon.com/Nightveil-Quiet-Girls-Barry-Reese/dp/197923261X/ref=sr_1_sc_1?ie=UTF8&qid=1509379563&sr=8-1-spell&keywords=night+veil+the+quiet+girls and Pro Se’s own store at www.prose-press.com for 9.99. The first entry in the Pro Se/AC Comics collaboration is also available as an Ebook designed and formatted by lo Iacono and Marina and available for only $2.99 for the Kindle at https://www.amazon.com/dp/B076ZDGYYK/ref=sr_1_2?ie=UTF8&qid=1509381413&sr=8-2&keywords=nightveil+the+quiet+girls. The ebook is also available for free via Kindle Unlimited for members. FOR IMMEDIATE RELEASE THE GUNSMITH #418-THE ART OF THE GUN NOW AVAILABLE! FOUR ROTATING ADVENTURES IN DIGITAL FORMAT- SUBMISSIONS OPEN FOR ‘PRO SE THRILLER OF THE WEEK’!